I made some Easter Egg Nests tonight! But the idea of chow mein noodles as the base freaked me out. Nope – I just can’t do it. I’m a cereal gal, so I used Fiber One (a tried and true pal in many recipes)! Some tips: I used Peanut Butter chips to color and taste the marshmallows. I’m not sure how many white birds nests I’ve ever seen out there, so this makes it more realistic. PAM, PAM, PAM. PAM your fingers so you don’t stick to the mess, and do this several times throughout. Work quickly to avoid not being able to shape the nests like you want them. 10oz. Bag mini marshmellows. Err on the side of more rather than less. 2. Measure out cereal and add to a giant bowl. 3. In a medium pot, melt butter over low heat until melted completely. Add marshmallows and stir until melted completely. 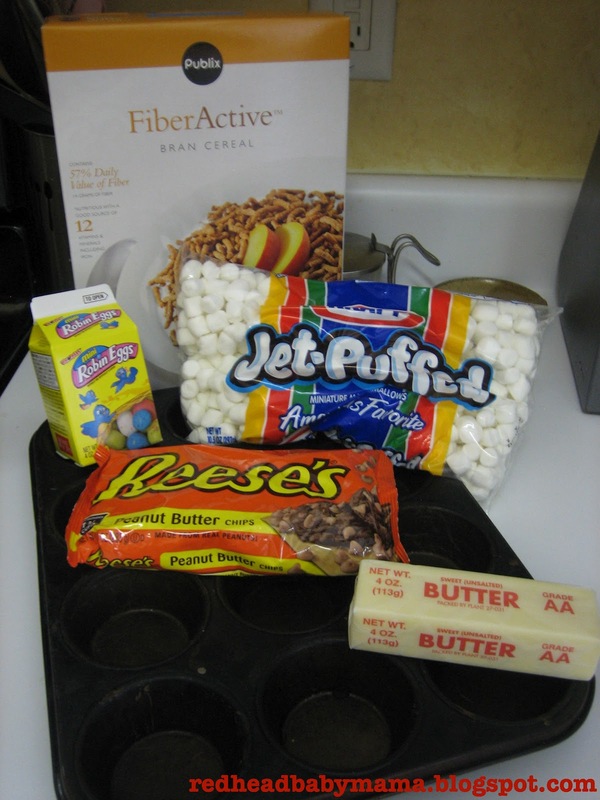 Add peanut butter chips until melted completely. 4. 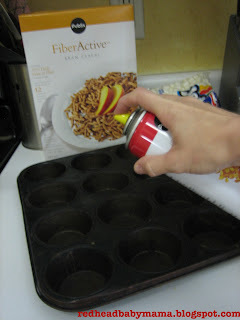 Add to cereal bowl and stir like crazy with a silicone spatula or spoon covered in PAM. Continue to stir until well coated. 5. PAM your fingers so you don’t stick to the next step. 6. Take bunches of the mix, and press into the muffin cups. Depress your PAM-ed thumb into the ball making a nook for the eggs. 7. Add the Whopper Eggs (3 per nest). 8. Remove from the muffin tin. Cover tightly and store or serve within the day. Did you make an Easter craft? I made easter bunny Cupcakes. I posted them on my facebook. They turned out so cute!! !